As one can imagine, the Japanese, steeped in tradition, honor, and culture, take their etiquette seriously. 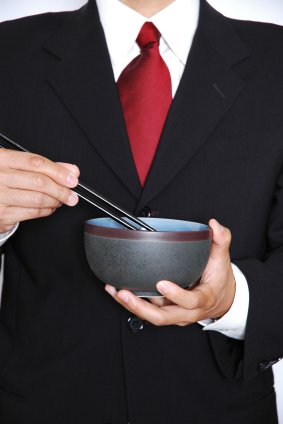 To correctly hold the rice bowl, place the bowl in one hand, hold it with one hand only, and use your chopsticks with the other hand. Your fine etiquette will be noticed. The thumb should be pointing up with the fingers gripping underneath. A woman’s fingers are expected to be placed quite gracefully underneath the bowl and a bit closer together as this connotes good upbringing and fine Japanese Etiquette.